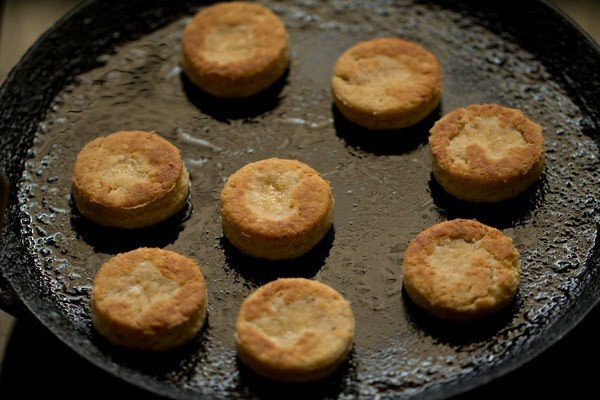 soft bread like cheese biscuits made stove top, on a tawa or skillet. 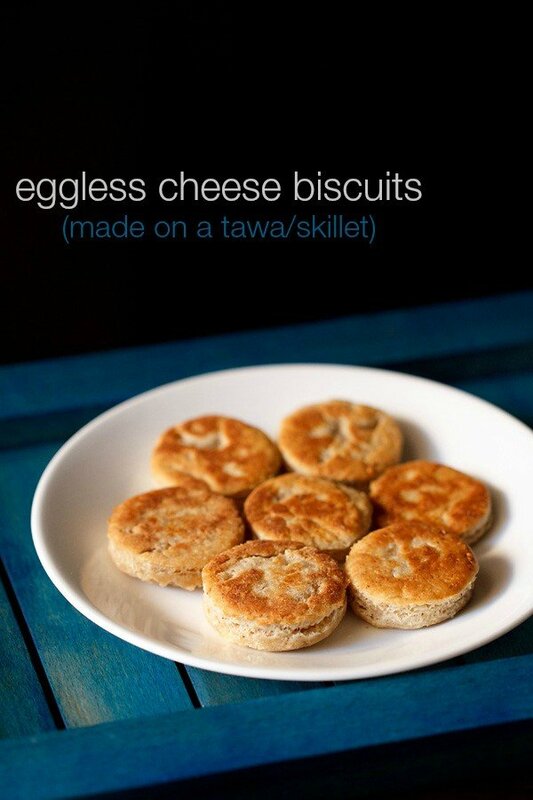 eggless cheese biscuits on tawa with step by step photos – soft cheese biscuits made on stove top on a tawa or skillet. these cheese biscuits have a bread like texture and are the american version of biscuits, similar to scones. they are not what we indians call as biscuits, which are crisp. more info on wikipedia. i have got a lot of requests to post baking recipes which can be made without an oven. hence this recipe, which is the first in these series and i plan to add more, as and when time permits. there are cookies, scones, cakes that can be easily made without an oven. if you have an oven, then you can check this recipe where the cheese biscuits are baked in the oven. 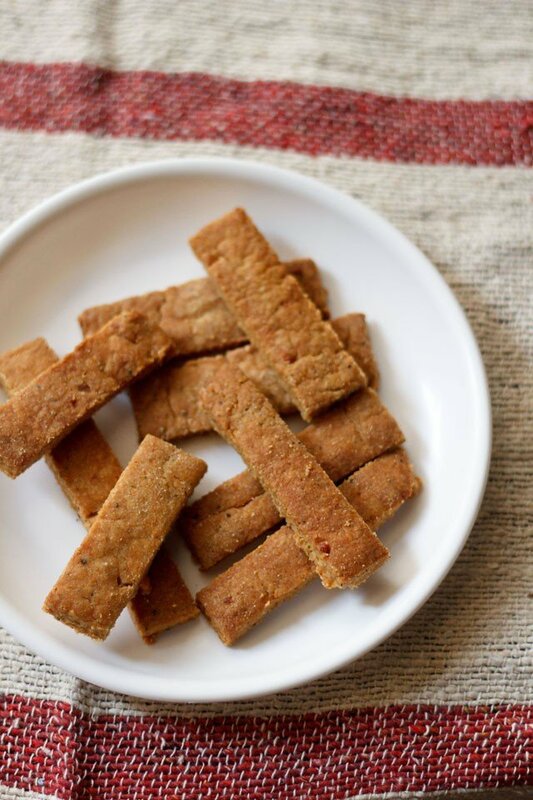 these eggless cheese biscuits go very well as a starter or even nice snack with tea or coffee. you can serve them plain or with a side cheesy dip. 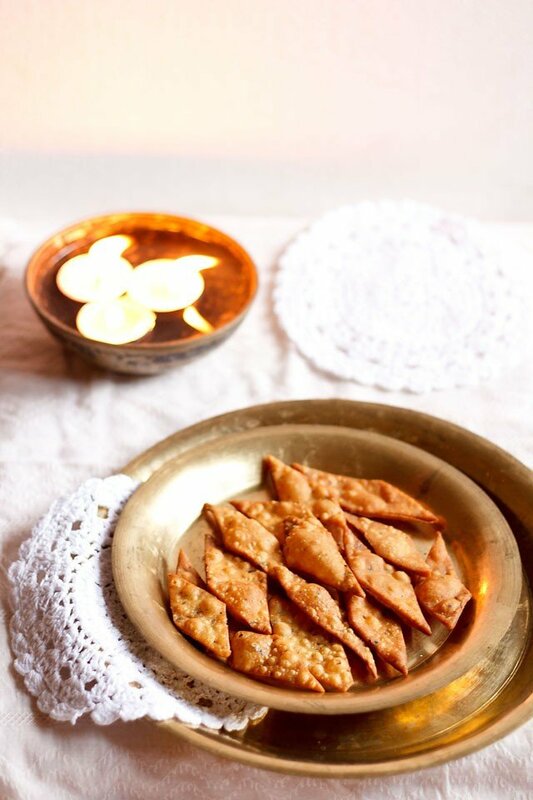 they also make for a good side snack in tiffin boxes. 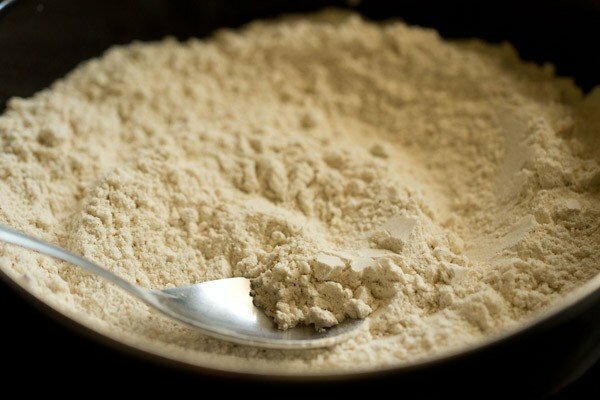 take 1 cup whole wheat flour (120 grams), 1/2 cup all purpose flour/maida (60 grams), 1/2 tsp salt, 1/2 tsp black pepper powder, 1/4 tsp baking soda and 1/2 tsp baking powder in a mixing bowl. with a spoon or spatula mix everything very well. you can also seive the above ingredients together. add 40 grams chilled butter. better to chop the chilled butter in cubes or sticks. you can add either salted butter or unsalted butter. 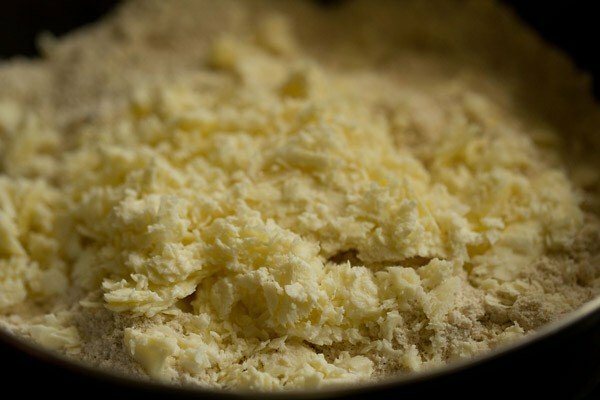 mix the butter with the flour. you can cut the butter with two knives and mix in the flour or do with both your hands. meaning just break the butter with your fingers in the flour and mix. this can also be achieved with a food processor or a stand mixer. 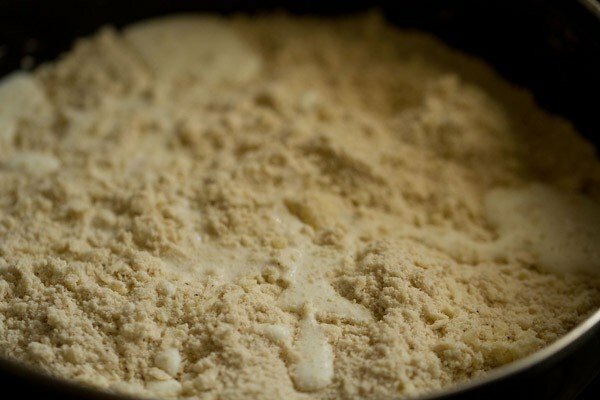 if the butter melts while mixing with your hands, keep the mixture in the fridge for some minutes and then start again. the mixture should get a bread crumb like texture. add grated cheese. lightly mix everything. add a few tbsp of milk in parts and start bringing the whole mixture together. add the remaining milk and continue to bring the mixture together. don't knead. overall 7 to 8 tbsp of milk is added. mix and gather and bring the whole mixture together in a dough. 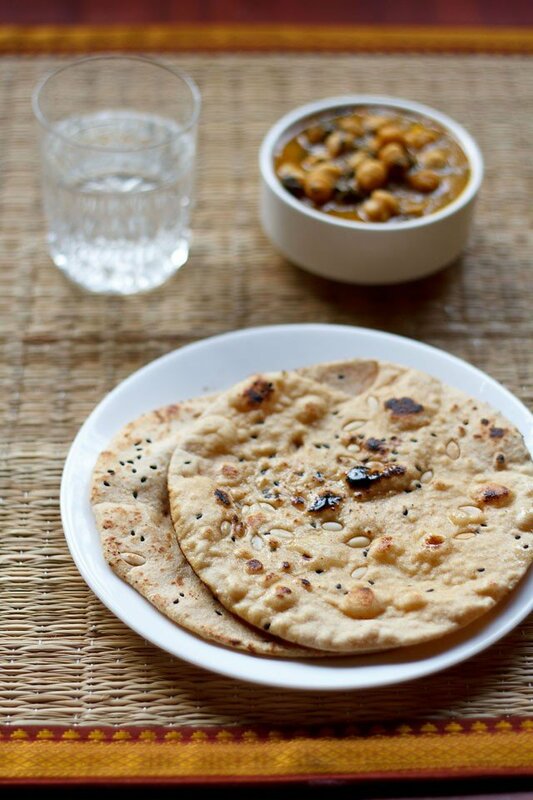 but don't knead like we do for chapati dough. 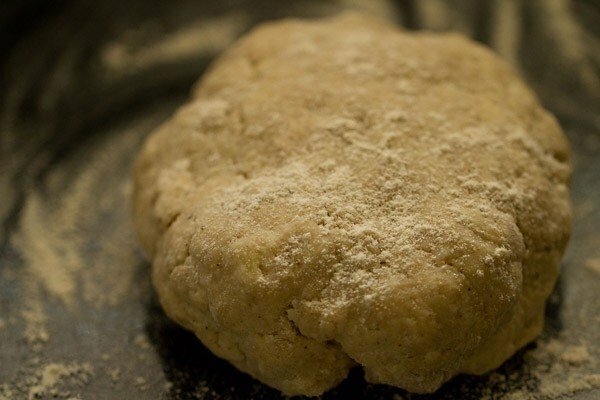 cover and keep this cheese biscuit dough in the fridge for 30 minutes. next sprinkle some flour on the work surface and roll the dough to get about 0.50 cm to 0.75 cm thickness. with a biscuit cutter or a small bowl, cut the rolled dough. 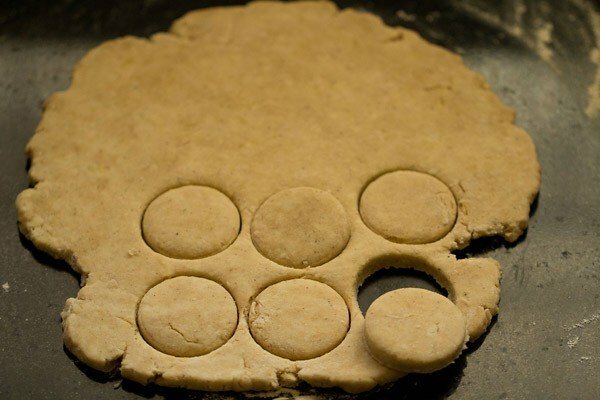 gather the remaining dough and again roll and get the biscuits with a biscuit cutter. heat 1 tbsp olive oil in a tava or griddle. you can also heat butter. keep on a low flame. place the cheese biscuits. keep the flame to the lowest, so that the biscuits don't burn. within a minute, flip the biscuits. you will see the bases have got browned. flip again and a couple of times more till they are evenly golden and crisp. these cheese biscuits cook quickly. takes about 3 to 5 minutes on a low flame. once done keep them on a wired rack and let them cool. make all cheese biscuits this way. add about 1/2 to 1 tbsp olive oil while frying the biscuits in batches. you can serve cheese biscuits hot or warm or at room temperature. they taste good as they are. but you can serve a cheesy dip along side. 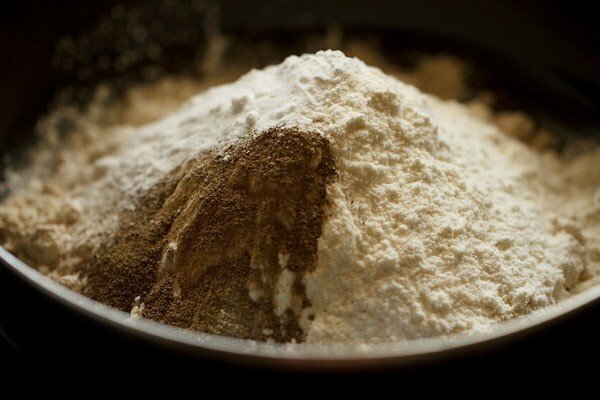 1. take 1 cup whole wheat flour (120 grams), ½ cup all purpose flour/maida (60 grams), ½ tsp salt, ½ tsp black pepper powder, ¼ tsp baking soda and ½ tsp baking powder in a mixing bowl. you can add your choice of spices & herbs too. to make it indian way, you can add cumin, red chili powder, carom seeds/ajwain or sesame seeds. 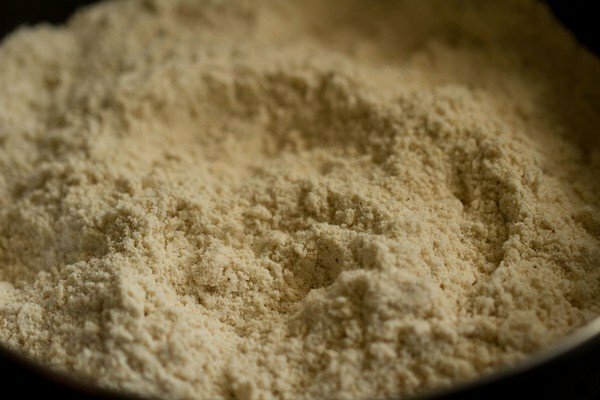 you can also make them completely with all purpose flour. 2. with a spoon or spatula mix everything very well. you can also seive the above ingredients together. 3. add 40 grams (3 tbsp) chopped chilled butter. better to chop the chilled butter in cubes or sticks. you can add either salted butter or unsalted butter. 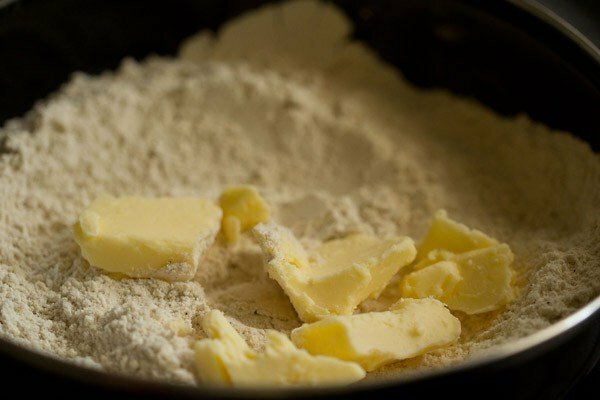 4. mix the butter with the flour. you can cut the butter with two knives and mix in the flour or do with your hands. meaning just break the butter with your fingers in the flour and mix. this can also be achieved with a food processor or a stand mixer. 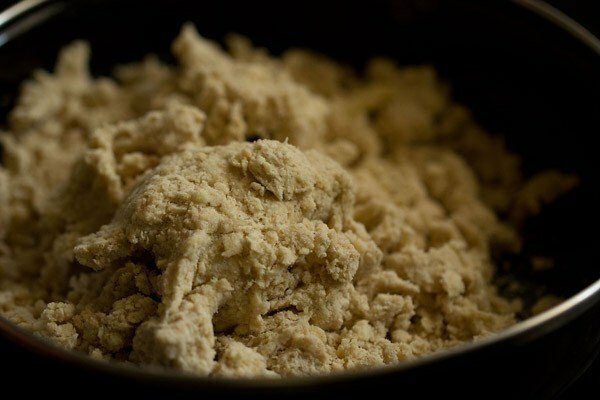 if the butter melts while mixing with your hands, keep the mixture in the fridge for some minutes and then start again. 5. the mixture should get a bread crumb like texture. 6. add grated cheese. 80 grams cheese, grated or about ½ cup tightly packed grated cheese. plain regular cheese or cheddar cheese can be added. 8. add a few tbsp of milk and start bringing the whole mixture together. 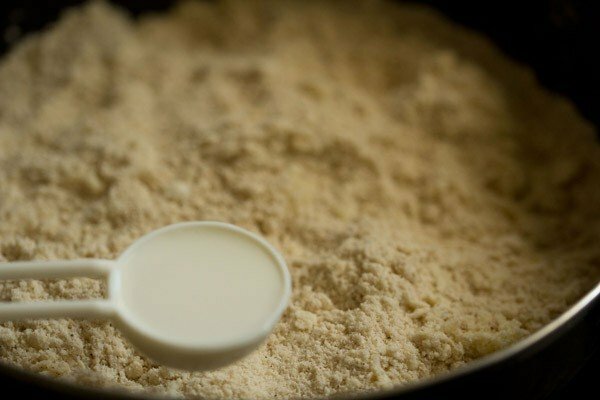 9. add the remaining milk and continue to bring the mixture together. 10. gather the mixture. don’t knead. overall 7 to 8 tbsp of milk is added. 11. bring the whole mixture together in a dough. but don’t knead like we do for chapati dough. 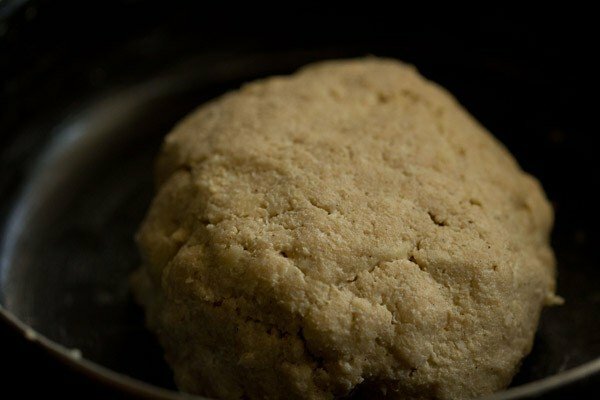 cover and keep this cheese biscuit dough in the fridge for 30 minutes. 12. remove the dough from the fridge. next sprinkle some flour on the work surface as well as on the dough. 13. with a rolling pin, roll the dough evenly. 14. roll to about 0.50 cm to 0.75 cm thickness. 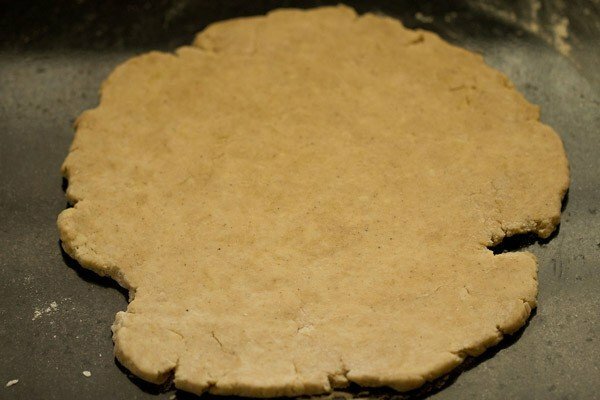 15. with a biscuit cutter or a small bowl, cut the rolled dough. 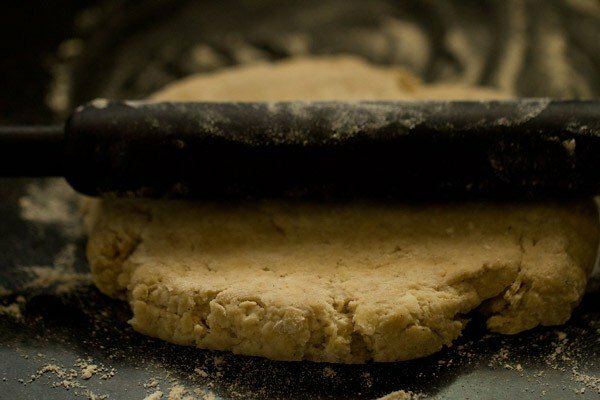 gather the remaining dough and again roll and cut the biscuits with a biscuit cutter. 16. heat 1 tbsp olive oil in a tava or griddle. you can also heat butter. keep on a low flame. 17. place the cheese biscuits. keep the flame to the lowest, so that the biscuits don’t burn. 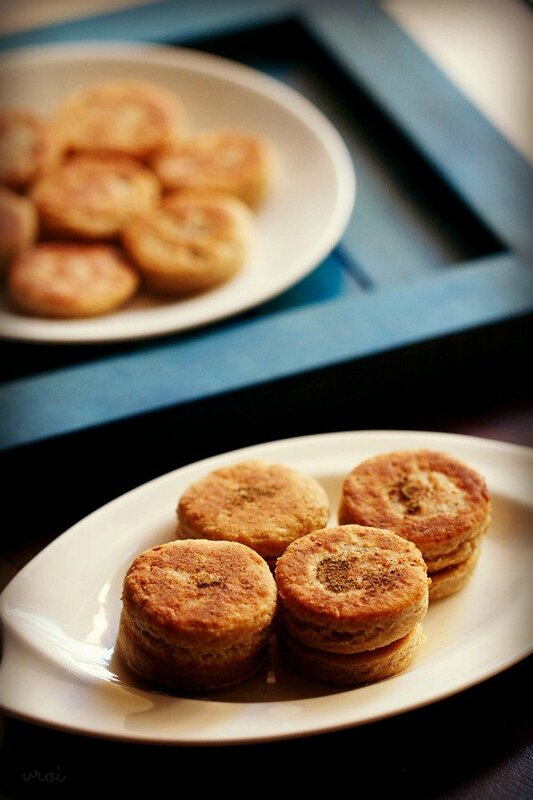 on a high flame, the biscuits will be browned or burnt faster from outside and remain uncooked from inside. 18. within a minute, flip the biscuits. you will see the bases have got browned. 19. flip again and a couple of times more till they are evenly golden and crisp. 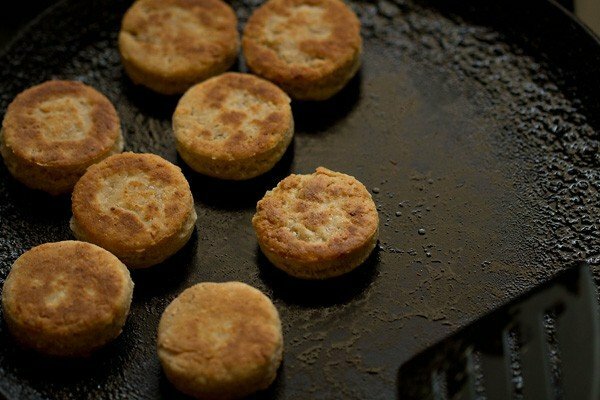 these biscuits cook quickly. takes about 3 to 5 minutes on a low flame. 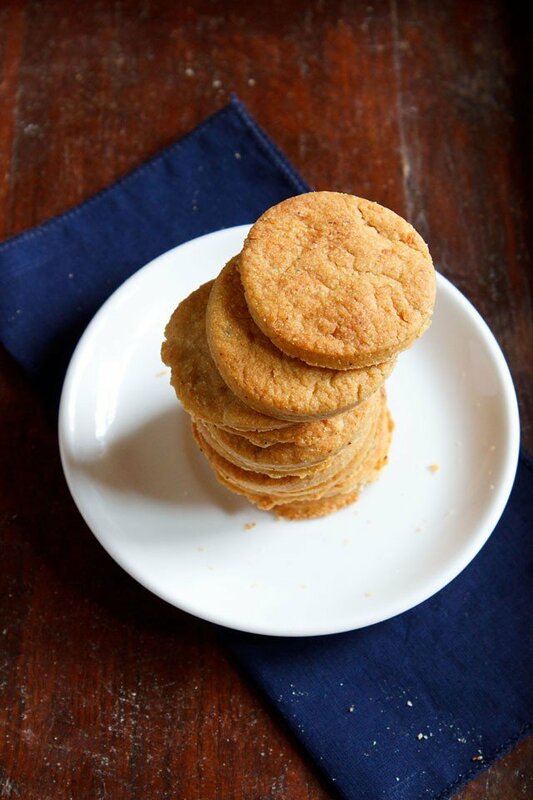 i cooked the biscuits in three batches and used 1 tbsp olive oil while frying each batch. overall i added 3 tbsp oil for cooking the entire lot. 20. once done keep them on a wired rack and let them cool. cook all cheese biscuits this way. add about ½ to 1 tbsp olive oil while cooking the biscuits in batches. 21 you can serve cheese biscuits hot or warm or at room temperature. they taste good as they are. but you can serve a cheesy dip along side or with a cup of hot ginger tea. you can also sprinkle some black pepper while serving them. when they are hot or warm, they are crisp. but when they get cooled completely, the crispness is not there and they taste a bit more soft and better. these cheese biscuits stay good in a cold climate at room temperature for about 2 to 3 days. otherwise keep in the fridge. makes about 28 to 30 small cheese biscuits. I had one doubt with this recipe though. is there anything I can do to ensure these biscuits would retain their crispiness if kept for a few days. would frying them help? thanks supriya and glad to know that your family considers you a pro in cooking. my concern is that deep frying may make the cheese melt and it may stick in the kadai or pan. baking will give a crisp texture. an alternative would be to pan fry or shallow fry, like how we fry tikkis or cutlets. but here also as soon as the base is golden and crisp, the biscuits need to be flipped. with shallow frying also, the biscuits will be crisp till hot. once they cool down, the crispness will not be there. for deep frying, you can check a few pieces to see how they turn out. also you can cut them like shankarpali (diamond cuts) and not round. i guess they will puff up while frying. but my only concern while deep frying is melting cheese. 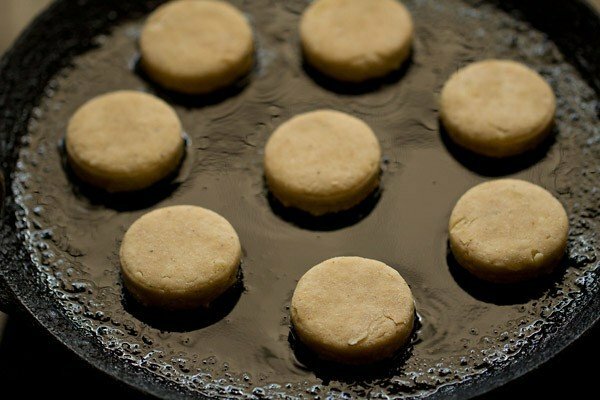 the biscuits should not burst and make a mess in the kadai. shubha, paneer cannot be added in this recipe. cheese is different from paneer. paneer is fresh cheese made by coagulating milk with an acidic ingredient and just involves a few basic steps – coagulating milk, draining the whey and then setting the paneer. whereas cheese is made with addition of a bacteria culture with the addition of rennet for some types of cheese. 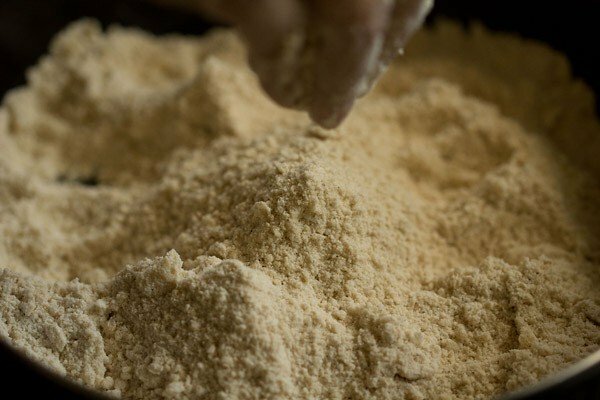 depending on the type of the cheese, the coagulating mixture is drained, cooked, pressed and then ripened or cured. or you can say that paneer is fresh cheese, whereas the other varieties of cheese are not fresh cheese. Hope this doesn’t taste kaccha in the middle.. Can I bake this? What will be the temperature and for how much time?? these do not taste kaccha in the middle. you can bake at 180 degrees celsius for 15 to 20 minutes. baking time will vary depending on the size, model and capacity of the oven you have. great swechha and you are always welcome. wonderful recipe!!! just wanted to ask can i use olive oil instead of butter when preparing dough to make it healthier??? yes you can use olive oil. Nice recipes nd very easy steps…. I made this today..i.dont know why the biscuits didint taste good..had u forgooten to mention to put sugar….bcz it was kadwa in taste …. these are not sweet biscuits, but savory ones. there is no sugar added in the recipe. the kadwa is due to the cheese as the cheese you used was not fresh or near expiry. when cheese is on the verge of getting spoiled or spoiled than it starts tasting bitter. if you use fresh cheese and one which is in its shelf life, then these biscuits taste very good. Dear, this recipe sounds great. Can u pls advice if the dough need to kept in freezer? thanks sunita. 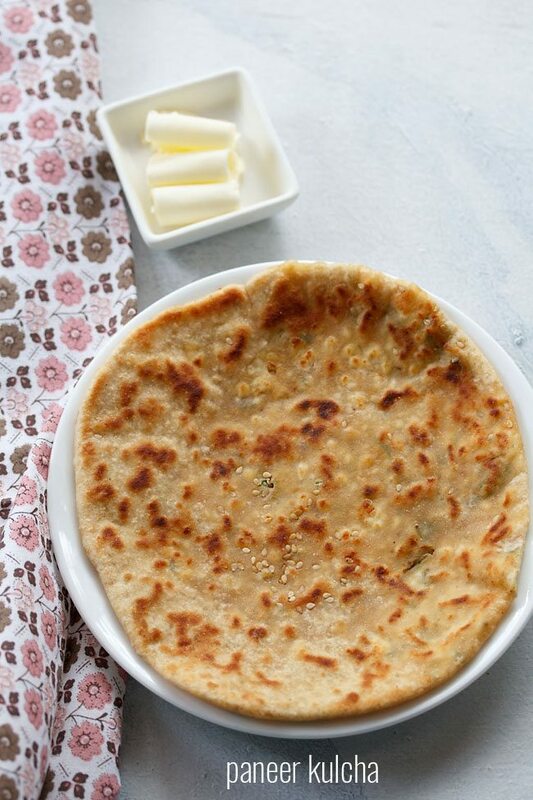 if you want to make it after some time then you can keep in refrigerator or in freezer. Have been following all ur recipes since few years. In fact I learnt the basics of cooking from ur website. Tried almost all ur recipe, got used to the recipe and I make every new uploaded recipe of Your recipes. most of them have turned out well.
. Loved this recipe… will try it! welcome manasa. glad to know that that the blog is helping you. thanks for sharing this sweet feedback. siddharth, you can try adding zeera or ajwain or yahan phir kali mirch ku koot (crush) kar ke add karo. welcome grishma. place the biscuits in a greased baking tray. pre heat the oven for 10 minutes at 180 degree celsius. bake at 180 degrees celsius for 15-20 minutes till golden or till you get the desired texture. 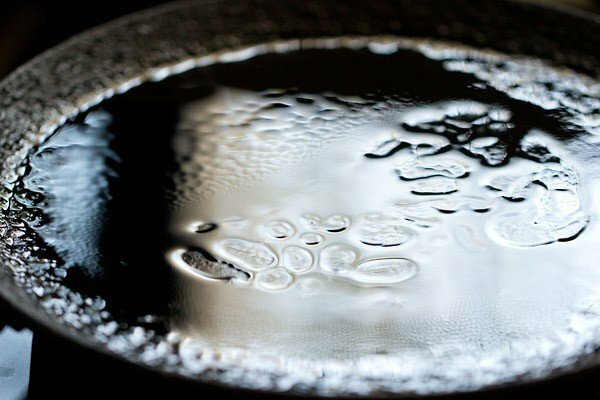 Can I use any other cooking oil like sunflower oil in this recipe and also can I skip baking soda. poorna, yes you can use any other oil. skip baking soda. but add the baking powder in the same quantity as mentioned in the recipe. 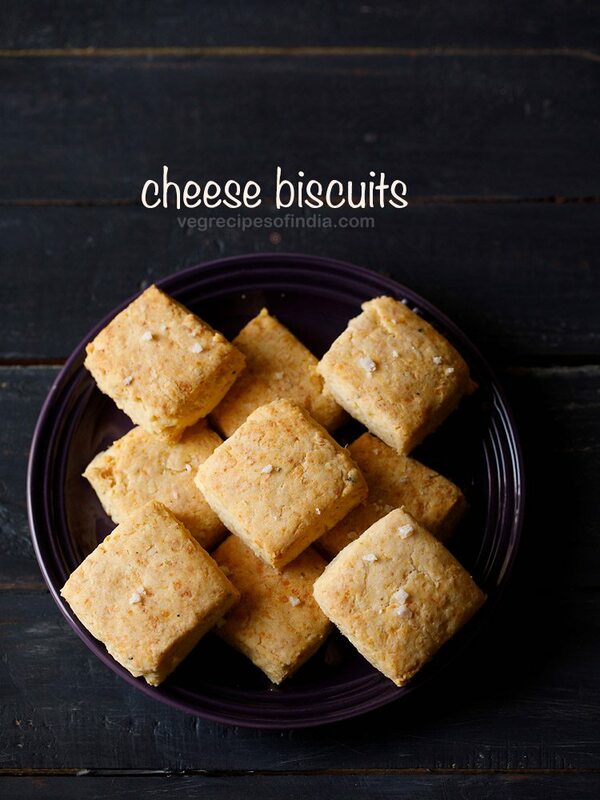 I have been visiting your space for a while and attempted some North Indian dishes with decent success 😉 I tried these cheese biscuits yesterday and they did come out very well. I forgot to add the baking powder though, would that make a huge difference? Also, very informative and alluring website you have, love your presentation and recipes. Thank you for all the hard work you put into making them into a step by step guide. Read your ‘about us’ section and was all the more impressed :). Have a nice day! welcome prabha. big thanks for sharing positive feedback on cheese biscuits and other recipes. glad to read your sweet words. 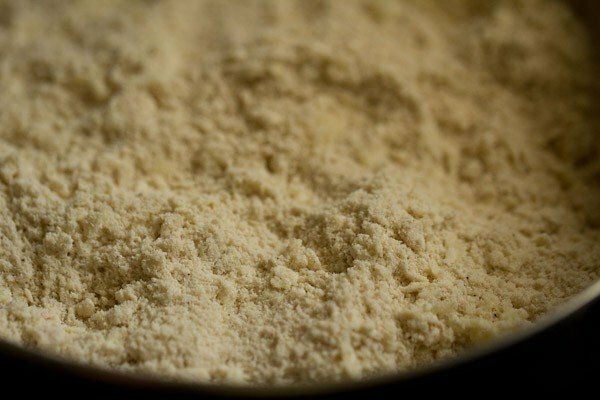 addition of baking powder will make the texture more softer. 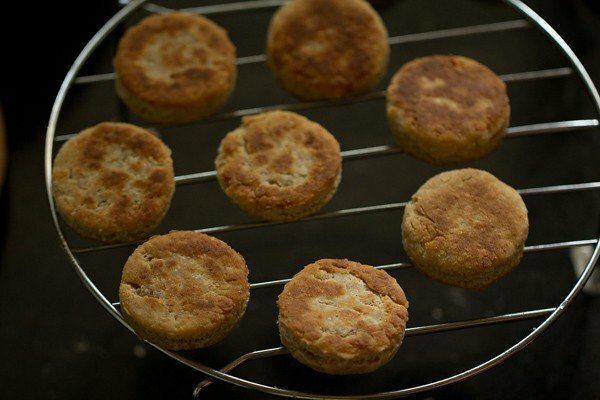 Can these biscuits be baked instead on pan fried? manisha, yes you can bake them. yes they will still be soft and texture like bread. they won’t be crisp. welcome simi. glad to know that you liked the way recipe is presented. 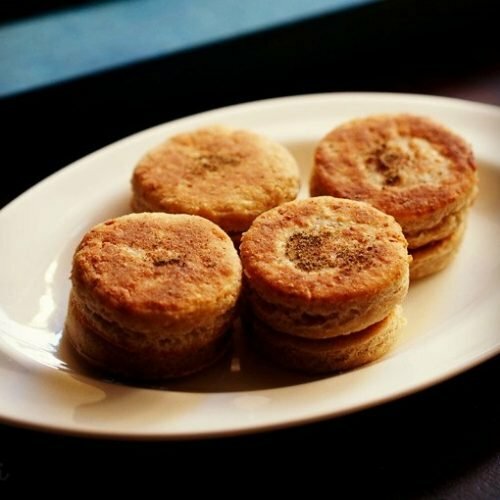 Hii apney abhi jo biscuits recipe post ki usmay jab aap tawa par biscuits daltay ho to olive oil kay sath kya kuch or bhi dala hai tawa ki surface par. poonam, only olive oil is added. nothing else. I saw this recipe and made it. thnks for this recipe. My kid loved it very much. Can we do the same method for nan khatai also? If I can pls share me .